Preview: Clemson may not have reached their ultimate goal in 2014, but it’s hard to be sour about a 10-3 season with a dominant 40-6 blowout win coming against Oklahoma. The Tigers really looked great towards the end of 2014 as they also closed the regular season with a 35-17 win over in-state foe South Carolina. Clemson has now won 10 games in 4 straight seasons and even with a lot of starters moving on this team still has plenty of firepower to challenge for the ACC crown. The Tigers’ OC Chad Morris moved on to become the head coach at SMU, but the offense should look pretty much the same with the new OCs coming from in-house promotions. 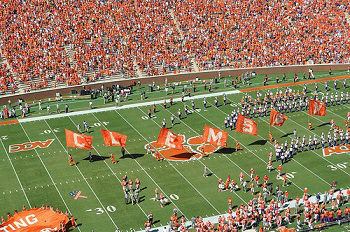 The key will be QB Deshaun Watson taking his game to the next level as one of the top guys in the nation under center. Watson missed considerable time in 2014 due to injuries, but he looked formidable throwing for 14 TDs to just 2 INTs. Watson is surrounded by talent at the skill positions with WRs Williams and Scott along with RB Hyatt. The O-line is the one area of concern with 3 guys needing to be replaced. The defensive unit has become a force under DC Venables and after having the top overall unit in the country last season this unit will need to replace nearly all of their starters. Losing a guy like Vic Beasley to the NFL hurts and the Tigers are hoping that DE Shaq Lawson can be the guy that takes his game to the next level. A relatively young LB group will be led by Ben Boulware. The strength of the defense comes in the secondary with returning guys Alexander and Kearse leading the way. Clemson was second in the nation in pass defense in 2014 and this unit will be counted on as the D-line figures things out. Prediction: Clemson has quietly become one of the most consistently successful teams in the nation under Dabo Swinney. The Tigers have recent high level bowl wins over LSU, Ohio State, and Oklahoma, which really gives an idea of where this team has been in recent years. The offense has a lot of potential and if the defense can figure things out early this team has the potential to win the ACC.